In a small glass or stainless-steel bowl, whisk together the mustard and water. Let sit for 10 minutes. Whisk in the mayonnaise, honey, 1/8 teaspoon salt, and 1/8 teaspoon dill. Heat the broiler. Rub the salmon on both sides with the oil. Put the pieces in a broiler pan or on a baking sheet, skin-side down, about 2 inches apart. Sprinkle with 1/2 teaspoon salt, 1/2 teaspoon dill, and the pepper. Broil the fish until golden brown and just barely done (the fish should still be translucent in the center), about 6 minutes for a 1-inch-thick fillet. Serve the salmon with the sauce alongside. 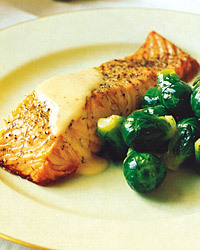 Fish Alternatives Because it goes so well with the sauce, salmon is hard to beat for this recipe. However, other thick fillets, such as grouper, sturgeon, or halibut, can be substituted. Test-Kitchen Tip If you broil or roast salmon fillet with the skin and want to serve it skinless, cook the fillet skin-side down and then simply slide a large spatula between the cooked flesh and the skin and lift the fillet. It's especially easy if you don't oil the skin or pan so that the skin sticks to the pan. Line the pan with aluminum foil for easy clean up. Dill and salmon are both best with a flavorful wine with lots of acidity. Try a Sauvignon Blanc (such as Sancerre) or Chenin Blanc (such as Vouvray) from France's Loire Valley.